Minor league baseball is back baby! Let’s take a look at the Washington Nationals system to see who is where and who I think is interesting and needs your attention. 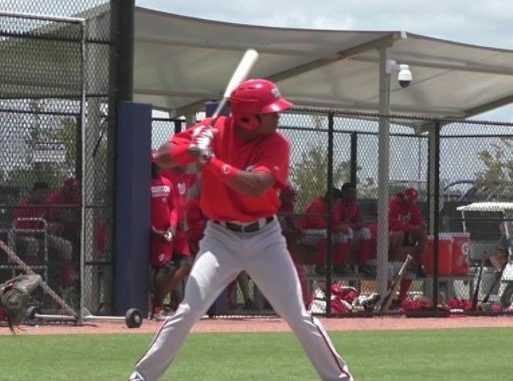 Rankings are from my Nationals Top 50 Prospects that was published in January. The Nationals A ball affiliate is, in my opinion, the most exciting. The roster includes: Juan Soto (#2), Luis Garcia (#5) and Yasel Antuna (#6). Anderson Franco (#26) is repeating the level after injuries and poor performance wreaked his 2017 season. Nick Banks (#43) and Armond Upshaw (#45) join Soto in the outfield and that core should make some great defensive plays. The pitching in Hagerstown does not disappoint with Jackson Tetreault (#13) and Brigham Hill (#15). Tetreault is one of the pitchers I am most excited to see. He was chosen in the seventh round in 2017 with an above average fastball and curveball. The Advance A ball affiliate for the Nationals does not disappoint with talent either. Carter Kieboom (#3), Blake Perkins (#19), and Tres Barrera (#29) all made the roster. It will be interesting to see the playing time between Barrera and Jakson Reetz (#36). Personally, I am higher on Barrera as he is better defensively and has more consistently produced with the bat than Reetz. However, according to scouts, Reetz has the higher upside offensively due to great bat speed. The Nationals’ pitching staff is interesting as well with Wil Crowe (#14), Matthew Crownover (#33), Sterling Sharp (#35) in the rotation and Joan Baez (#24) and Gabe Klobosits (#38) in the bullpen. I think Klobosits has a chance to shoot up the system. He was drafted in the 36th round last year and had a 11.3 K/9 and 2.3 BB/9 in 30.2 innings last year. The Senators roster is not as exciting as the previous two. However, Daniel Johnson (#8) and Kelvin Gutierrez (#9) are some position players you should keep your eye on. Johnson really broke out in 2017 by hitting .298/.356/.505 in between two levels last year. Gutierrez was having a great 2017 before an ankle injury limited him to only 68 games. The Nationals AAA team has the cream of the crop prospect Victor Robles (#1). He was injured playing the outfield on April 9th. It’s reported that he hyperextended his left elbow and they’re waiting until the swelling goes down before further evaluation. I hope it is not a major injury. Other position players on the roster include Andrew Stevenson (#10) and Jose Marmolejos (#16). I am interested to see what Stevenson does this year. It was reported that Stevenson worked on launch angle with Daniel Murphy‘s hitting coach. Erick Fedde (#4), Austin Voth (#22), and Austin Adams (#34) are some interesting pitchers that should see time in the bigs this year, especially if A.J Cole continues to pitch poorly.